Eryx colubrinus is a small sized boa species. These snakes are heavily built with small heads, small eyes, and short tails. The color pattern may consist of a yellow or orange coloration overlaid with dark brown splotches. The belly is white or cream colored. They are readily available in the pet trade due to their small size, docility and ease of care. In recent years there have been a number of new morphs made available by both commercial and hobby breeders. Although sand boas burrow and spend a great deal of time under the sand, they will readily use hides placed on top of the sand. These habitat additions provide you with more viewing opportunities and a place for your snake to feel safe above the sand. An upside down terra cotta plant saucer works nicely: break a small piece off once side to make a peek hole. A hollow, Chollo cactus skeleton placed directly on the sand is another favorite hiding place of sand boas. One of the options of substrate that can be used is sandblasting sand (buy at a landscape supply store). Make it deep enough for your boa to ‘swim’ in and stay comfortably buried. Ground walnut shells and aspen bedding can be used, but they do not provide any resistance exercise for the snake when it moves. Eryx colubrinus prefer to live in sand at a temperature of 32-35 °C (90-95 °F) during the day. The best way to achieve this is to place a heat tape under ONE side of the cage. Always be certain there is a cooler side for the snake to move to if the temperature gets too warm. The cool side temperature should range between 24-29 °C (75-85 °F). You can monitor your temps either by placing the thermometer in the sand or by using temperature gun if you have one. Eryx colubrinus are from an equatorial region so they do need some humidity, perhaps as much as 40%. 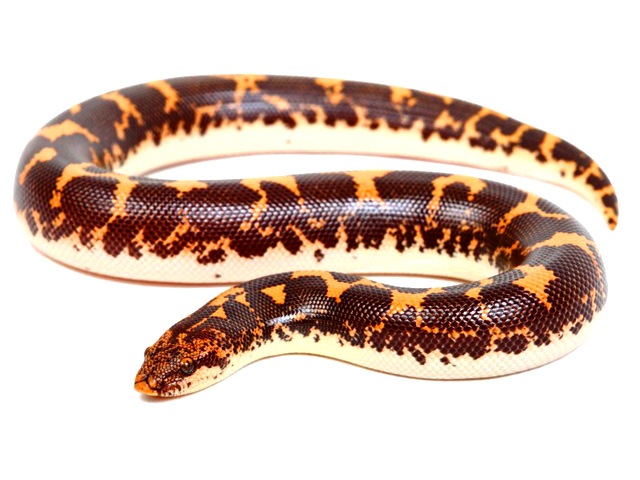 A robust keeper, sand boas are known for their hearty appetites. Newly hatched babies are started on live pinkie mice, but can usually be converted to less expensive frozen pinkies in a short time. If you have one snake in the enclosure, put a live pinkie directly on the substrate. Because it may be damp, a thawed pinkie should be offered on a paper or plate to prevent sand from sticking to the meal. Expect your snake to eat within one to two hours, occasionally it make take longer. As a snake grows, larger pinkies, fuzzies, hoppers, mice and finally, small rats (live or frozen) will become appropriate. An adult feeding schedule of 4 to 8 times a month for females and 1 or 2 times a month for males is recommended. Snakes need heat to digest their food. Limit handling immediately after feeding. A clean cage insures a healthy environment for your snake. Spot clean as necessary and plan to change the sand once a month or two and thoroughly wash and sterilize the enclosure at the same time. Mites are the most common snake concern. Fortunately, sand boas seem to be resistant to the parasite. Another health concern is mouth rot (a moist, white, mucous-like appearance around the lips); using sand as substrate and thorough and regular cage cleaning can prevent it.